Latest news, tips and tricks on remote desktop, live chat, web conferencing. Whether sipping piña colada in the shade of a palm tree, catching big waves with your surfboard, or withdrawing into the coolness of beautiful mountains, chances are you’ll be spending some time off this summer with a cell phone in your hand. We give you 5 ways to keep your office emergencies under control even from your own secret little corner of the world. Even though most countries promote paid time off, some even with legislation, the survey shows that in reality workers only take a part of their annual paid leave. Americans, for example, use 10 of the 14 vacation days allotted each year, or 71% of their annual paid leave, while 13% report taking none. Japanese workers take an average of 39% or just 7 out of 18 days of their annual paid leave, while a whopping 17% of the Japanese are apparently so dedicated to their work that they will not take a single day of their paid vacation off. Unsurprisingly really, Japan ranked last in worker satisfaction, with only 60% of Japanese workers liking their job situation. Considering the fact that it’s so hard for so many people to leave the office, although it would actually be beneficial for their physical and mental health to do so, we’ve come up with these 5 tips that will make such a decision a lot easier. 1. Get a fellow backup to cover for you during vacation. Because of the way we are working, the data shows that you need to take a vacation to stay healthy and the best vacation is the one when you can truly disconnect from work. To do that, try planning your absence well in advance, discuss a backup plan with your manager, find a suitable person to take on your responsibilities, and train him/her. Plan a meeting with your backup before and after your time away to assure a smooth continuation of your work, while also delegating your business emails to your backup so that he/she can act on your behalf and disturb you only for true and unforeseen emergencies. 2. Pack a reliable mobile hotspot to stay connected everywhere you go. No matter how well organised you are, there are always tasks that cannot be either planned, postponed or carried out by your backup. That’s why going on vacation prepared will let you deal with emergency situations much faster. And the very first must-have is a reliable internet connection. 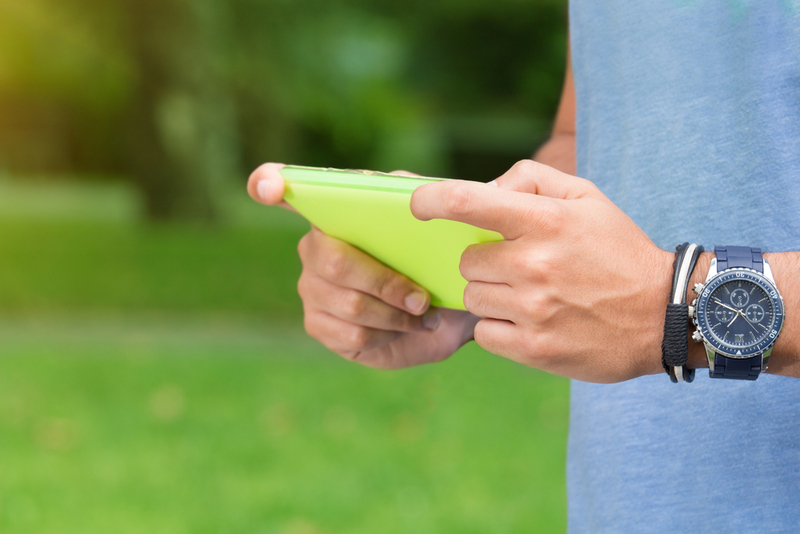 Instead of counting on the questionably secure free Wi-Fi, go for a mobile hotspot instead. They pack fast internet access into tiny, pocketable devices so you can stay connected wherever you go. With so many options of devices and carriers, varying in cost, speed, and reliability, try to select an affordable and reliable mobile hotspot that will get you through any job easily. 3. Set up your mobile device for business. Thanks to the proliferation of smartphones and tablets, you can easily perform practically any job right from your mobile device. But first you need to set it up for work, adding your business mail account, strengthening your security passcode, possibly adding a fingerprint login, turning on all available security mechanisms with a remote wipe included. Android also lets you set up a Work profile to keep it separate from your personal space (read Set up Android for Work on Android 5.0+ devices). 4. 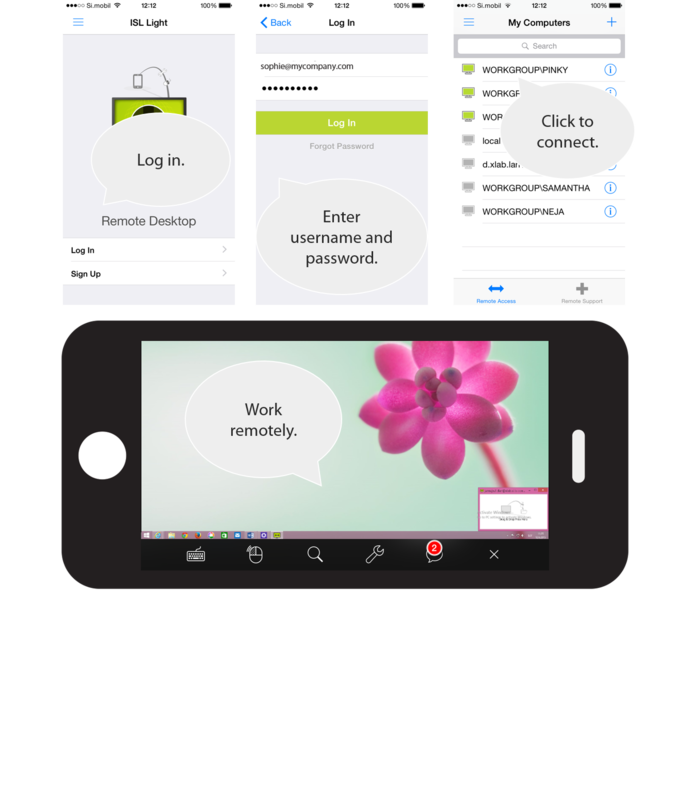 Install a remote access app on your mobile or tablet. Although a smartphone or a tablet will let you deal with smaller office hiccups, serious tasks require your own work computer, its applications and documents. If you’re not planning to take your laptop with you, you’d better set up a quality remote access app on your mobile device and install a small end-user application on the computers you are planning to use remotely. The app will let you access and work on your office PC or Mac or another unattended desktop device right from your phone or a tablet. Existing users of ISL Online are welcome to install a remote access app on their iPhone, iPad and Android without any extra charge. Others are welcome to start a no-obligation fully functional free trial of this cloud-based enterprise oriented remote access and on-demand support software. To be able to tap into your office computer from anywhere, it needs to be left turned on or it will appear as “offline” in your remote access app, and as such will not allow a remote connection. So, before you leave, log into your remote access app on your mobile to make sure that all the needed computers are certainly available for access. To avoid that awkward situation when you need to tap into your remote computer but have forgotten to leave it running, make sure you have turned on the Wake-on-LAN setting before you set out for vacation. Luckily, most of the better equipped remote access tools will let you access it anyway with a few tweaks made beforehand. Learn how to access a remote computer even if it’s shut down. This entry was posted in Android, happy holidays, Mobile, remote access, remote work, Uncategorized and tagged android remote access, holidays, ipad remote access, iphone remote access, mobile hotspot, remote access, remote work, vacation. Bookmark the permalink.